Be the first to share your favorite memory, photo or story of Forrest . This memorial page is dedicated for family, friends and future generations to celebrate the life of their loved one. 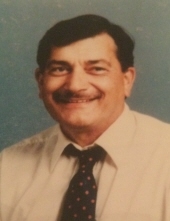 Forrest Wisehart, 80, passed away on Sunday, March 24, 2019. He was born Dec. 2, 1938, in Hancock County, near Shirley, Ind. He spent most of his life in Shirley, Kennard and New Castle. During the past year and a half, he lived at Yorktown Manor. His sisters, Fern and Ina, and brother-in-law Jim, visited him often and enjoyed every minute spent with him. He was a blessing to his family. His father was Homer Wisehart, and mother was Chloe Davisson Wisehart. He was the sixth of eight children. Forrest was extremely close to his father whom he loved very much. He worked at Smileys Body Shop in New Castle for about 10 years around 1970 and also at several other auto-body shops. Forrest loved automobiles; he knew nearly every make and model. He enjoyed going to car shows. One of his favorite cars was the old Studebaker, as he owned one when he was a teenager. He enjoyed playing Dominoes and was outstanding with numbers. He was the most giving person and always would let others win the games to make them happy. He loved people and life. He always gave a helping hand to anyone in need. He was an extremely good-hearted person and kind. Forrest always was there to help anyone, as it brought him happiness. He enjoyed visiting his sister, Ina, on Sunday afternoons; they had endless hours of enjoyment playing Dominoes, talking and laughing. Forrest was so honest that if he found a penny he would not pick it up since it was not his. He was like a father figure who was extremely honest and instilled good values in his brothers and sisters. He attended the Nazarene churches in Shirley, Warrington and New Castle. He enjoyed the Bible and attending church. When his sister, Ina, went to college, he loaned her his little Volkswagen Beetle. She always could depend on him and will miss him terribly. There are no words to describe the loss of her brother, Forrest. Forrest is survived by two sons, Danny Wisehart and Jack Wisehart; daughter, Marcella "Marcy" (Wisehart) Penry; several grandchildren; four sisters, Virginia (Dean) Reason of Shirley, Beulah (Boyd) Watt of New Castle, Fern Davis of Anderson and Ina (Jim) Scanlon of Yorktown; and many nieces and nephews. He was preceded in death by his parents, Homer Wisehart, in 1984, and Chloe Davisson Wisehart, in 1983. one brother, Luther Wisehart of Somerset, Ky., in 2016; and two sisters, Velma Wilson of Warrington, in 1978, and Vuanita Ward of Lutz, Fla., in 1998. Forrest was a kind, gentle and giving person who loved life, family and friends. He was so special as he had a good heart. He was the best brother who was truly a gift from God. Forrest is loved so much and will be deeply missed by his family and friends and those who knew him. To send flowers or a remembrance gift to the family of Forrest Wisehart, please visit our Tribute Store. "Email Address" would like to share the life celebration of Forrest Wisehart. Click on the "link" to go to share a favorite memory or leave a condolence message for the family.